This card came out so beautifully that it has earned the honor of being the screensaver on my cell phone. 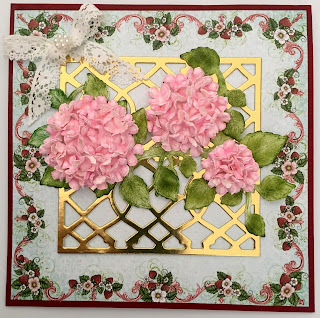 I used the Heartfelt Creations Berry Café paper, stamps and dies to make this card. The trellis is from an Anna Griffin die. A lovely lady named Emma Lou does a wonderful job of teaching the techniques to make these beautiful flowers. I sponged the pink on each flower before it was assembled. It does take a lot of time and attention to detail to make these, but they are so worth it! I just wanted to visit and say hello. I love all your projects and I want to wish you good luck in the semi-finals for Heartfelt Creations!